A thrill-seeking Finnish dwarf-served in UCAS Advanced Experimental Air Wing with Harmony Craig Bottow. After being discharged, they were both quickly recruited by corp headhunters-HCB to NeoNet, Mikko to Evo. Both ended up on Mars, flying anything they can get off the ground. They sometimes vacation together, seeking bigger and better adrenalin rushes. Unlike a lot of wageslaves, these two actually do it for real: no simstim here. 29 years old. He disappeared from his corp shortly after HCB’s supposed death on Deimos, and his current whereabouts are unknown. He was apparently detained by LoneStar after they raided a shadowrunner hideout that he was using. 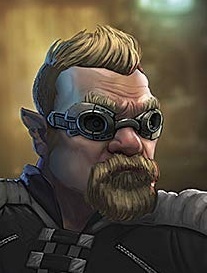 It seems that Mikko had taken up shadowrunning (following HCB’s lead), and joined Marlowe’s crew. He was picked up for the Prime Runners team, and was killed by the team.